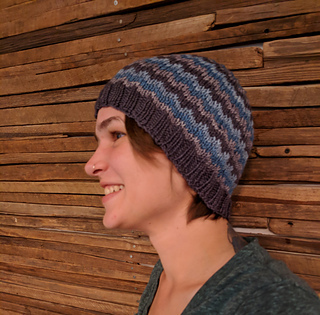 This bargello flame stitch hat has so many possibilities! Go demure, go wild, use all your odds and ends. Make it a beanie or a slouch – you decide! This is Hat #3 in the 12 Hats of Christmas KAL going on in the Criminal Knits…for the Serial Knitter in all of us. Group, come join us for all the fun! As pictured: In S/M: 4 86 yard skeins of sport weight yarn. Each section used about 3 grams of yarn, with the brim using about 5 grams, so I had a fair bit left over of each. You can easily make this hat using worsted weight yarn, too, and size 6 or 7 needles. You’ll just need to adjust yarn amounts accordingly as you’ll need a wee bit more per section.